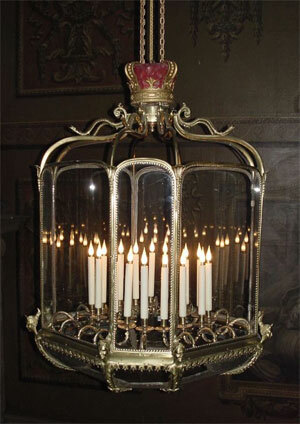 This octagonal brass lantern with glass panes has sixteen candle arms, drip pans and candlecups. It measures 1500mm high, 900mm wide and 900mm deep and weighs approximately 150kg. Prior to conservation, the metalwork of the lantern was very dull in appearance and had many areas of missing lacquer. A small section of applied decoration was missing from the lower section. The surface wiring had perished and was unsafe. Several panels of glass were cracked or broken and some of the brass elements were either missing or were 1950s replacements. The wooden crown cover was dirty with some scratching and paint loss. 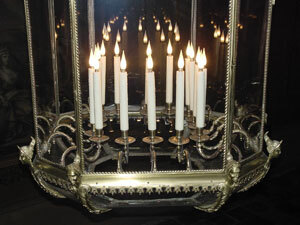 To begin the conservation, the lantern was totally dismantled and the glass and wiring removed. All pin fixings were checked and secured, all distortions were corrected then all the metalwork was cleaned, removing all old shellac-based lacquer, then lightly polished and degreased. The metalwork was then relacquered. The missing piece of decoration was recast and replaced. The crown was lightly cleaned and retouched. The lantern was then reassembled. The re-electrification was carried out and certified by an accredited NIC electrician to the specification required by Historic Royal Palaces. Then the lantern was reglazed using a ‘Georgian’ ripple effect sheet and slumped glass. These pieces were puttied into place using a tinted linseed oil based putty. Secondary copper tags were soldered in place where necessary to help hold the glass in place.